Product Predictions are the top fifty items for which a user is most likely to have an affinity and which the user is most likely to purchase. Product Predictions are unique for each user, leverage the same breadth and depth of data as our user predictions, and are similarly computed on a nightly basis. You can see the top ten predicted products on a user’s profile via the user lookup page. 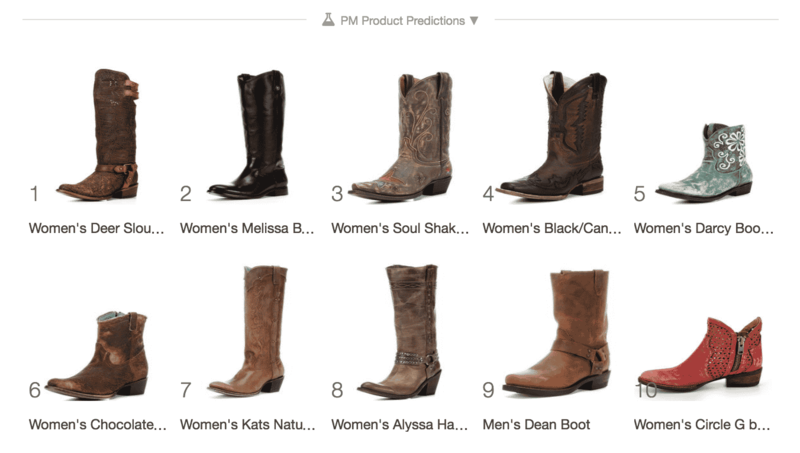 Product Predictions are highly accurate. In client tests, they showed a significantly higher precision vs. popularity-based recommendations. Our interest based recommendations are a result of matching content to user tags. Product Predictions do not incorporate interest tags, and can be created even if you do not have tags on your site/content. Product Predictions are useful in cases where you have minimal signal regarding visitor intent or tag-based interests. For example, they work very well on landing pages powered by Sailthru’s Site Personalization Manager (SPM). Additionally, they are effective in unique, or one-time marketing sends, like win-back campaigns or post-purchase emails. Product Predictions also give you the option to start with products rather than users. You can create a list of users based on predicted interest in purchasing a particular product or set of products, then target them for marketing purposes. We would recommend against using Product Productions alone as a replacement for interest-based recommendations in email campaigns, given that the set of predicted products does not change significantly from day to day. You can access Product Predictions two ways: in template code (Zephyr) and on each individual user profile. Use the item_predictions function to retrieve an array of item IDs. Then intersect this array with the content feed that you have assigned to the template, to be able to access and display metadata such as title, image, URL, etc. In the top-right, click the search icon, enter an email address of a user, and press Enter. On the User Profile, scroll to the section labeled Predictions.